The Question: How Many Bags? 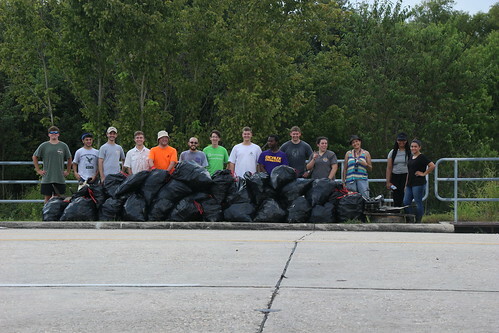 This weekend we had a crew of volunteers come out and hit the Litter Banks of Ward Creek near Siegen once again. Should we consider it an improvement to have “only” come up with 42 bags worth? 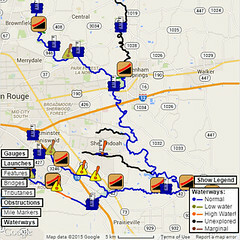 It was another busy weekend with PaddleBR. On Saturday, we split up, dropping in on the demo day with The Backpacker at University Lake and bringing a few canoes up to Flanacher Road Park for a small BREC Outdoor Adventure event. 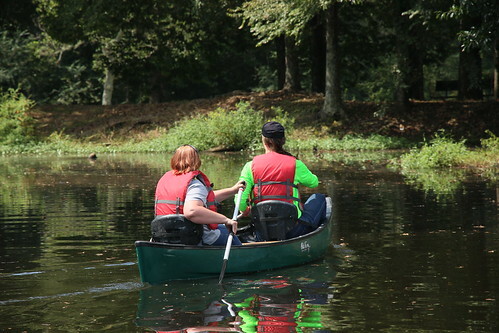 We got a bit of paddling in up in Zachary, and a bit of rain, too, down at Wampold Park, but a good time was had by all. Then it was off to fly a quick scouting mission before Sunday’s cleanup. I think we were one week off with our weather order. The mini-fall we recently had was well and truly back to a very humid summer pattern. After being grounded Saturday morning (overcast at 400′ — meaning I could fly only up to… negative 100 feet) and waiting out a line of thunderstorms Sunday afternoon, finally the skies cooperated and the scouting flight could take off. The images coming back were encouraging. 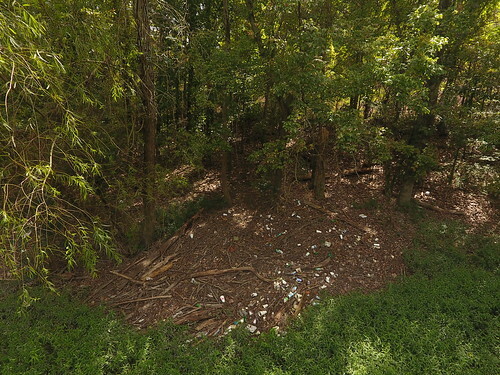 There was much less total litter than this spring. Still plenty to pick, but the 150 bags in a day record would certainly stand. Mike, Rachel, and I worked with around 15 or so volunteers, ferrying them and their haul back and forth in a canoemaran (and blazing a few trails through the overgrown sections of bank to get to the litter and get the haul out). With groups on both banks heading both upstream and down, we made quick work of collecting. In three hours or so, we had 42 bags of litter off the banks and up to the side of the road for DPW to pick up. I’d call that a great success, and a good time was had by all. 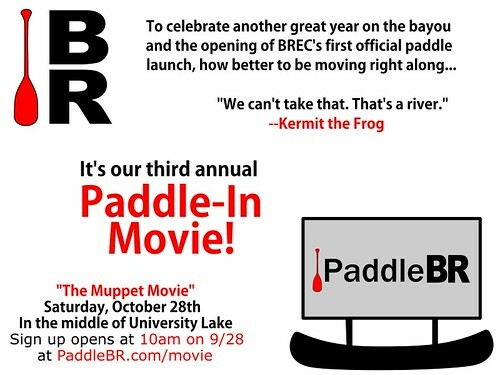 And speaking of good times, our third annual PaddleBR Paddle-In Movie is now scheduled. We’ll be launching the Movie Dock onto University Lake the last Saturday of October (which is, conveniently, LSU’s bye week). In 2015, we screened “The Princess Bride”. Last year, it was “Stardust”. And this year, we’re back with “The Muppet Movie”. We’ll be sending an email out Thursday to our supporting members to give them early access to tickets and boat reservations, and then on September 28th at 10am, the ticket window will be open for all. For anyone who doesn’t have their own canoe, kayak, or paddleboard for the movie, we’ve put together a fleet of 15 canoes and nearly as many kayaks that are available for reservation. Tickets and boat reservations are always free, as are our traditional souvenirs and themed snacks, but you definitely want to get your tickets before they’re sold out. Supporting members, check your email today, and all of our other friends, mark your calendars for next week.